Writing Across the Landscape - Description | W. W. Norton & Company Ltd.
Lawrence Ferlinghetti—legendary poet and best-selling author—collects here his travel journals. 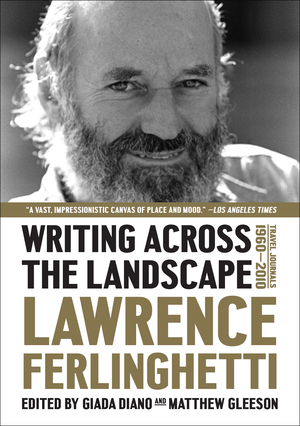 Traversing the latter half of the twentieth century to the present, Writing Across the Landscape positions Ferlinghetti as a major voice whose personal writings are now added to the fabric of twentieth-century literary history. The volume gives glimpses of figures like William Burroughs in London, Ezra Pound in Italy and Fidel Castro at the dawn of the Revolution. Readers will journey to Mexico, Morocco, Paris and Rome, as well as to post-Stalinist Russia on a harrowing journey on the Trans-Siberian Express. Embedded with new poems and Ferlinghetti’s pyrotechnic prose, Writing Across the Landscape evokes the people, places and political movements that have shaped our time. Ferlinghetti’s A Coney Island of the Mind has become a modern classic. It has been translated into nine languages and there are now three-quarters of a million copies in print. The Secret Meaning of Things is Lawrence Ferlinghetti’s fourth book of poems.